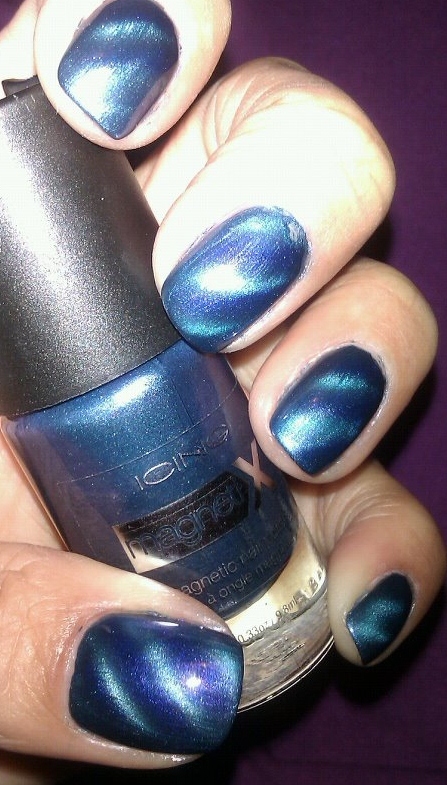 When I saw the magnetic polish on a fellow nail polish bloggers site (I can't remember which) I just had to have it. 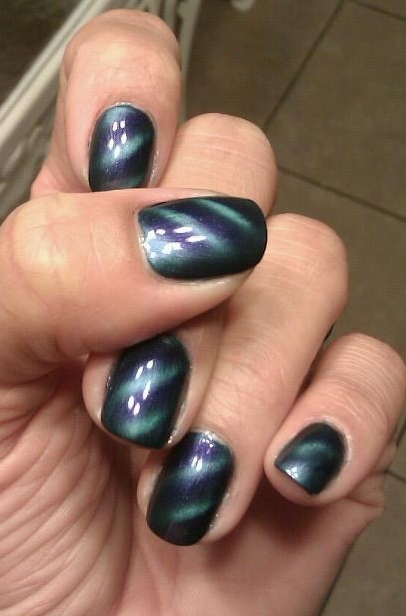 I was fascinated by the idea of drawing designs out of magnetic properties in nail polish. Especially since I'm design-challenged, this was perfect for me and seemed so easy to do. My first magnetic polishes were gifted to me by my husband for Christmas 2011 and he picked out the Golden Bronze and Changing Lilac from the Layla brand. This brand is cheaper than Nail, Inc. and doesn't have the lip guard attached to the top of the magnet. The magnet is also not that strong, but the colors are lovely. Then I heard that Icing was coming out with an even more affordable set of magnetic polishes so I had to try. I called this Opposites Attract as a pun on opposing forces of magnets. Thoughts? Feelings? Concerns? Very blue under the light and the designs show through nicely. Will add the other 3 magnetic colors I have in a later post.